“The Kosher Tomato” has been my name ever since I started my Personal Chef Company way back in 2007. I was only catering to Kosher (and Kosher style) clients and I needed to have “Kosher” in my name so that they could find me! Starting around 2009 when I got engaged to be married, I started working a “normal desk job” for more stability and was working less as a Personal Chef, but intermittently kept up my blog. It was really just a way to keep up my love of food and cooking and share my passion. More on my about page. It was only since about 2 years ago that I took my blog a little more seriously and I realized that “The Kosher Tomato” no longer felt like the right fit. 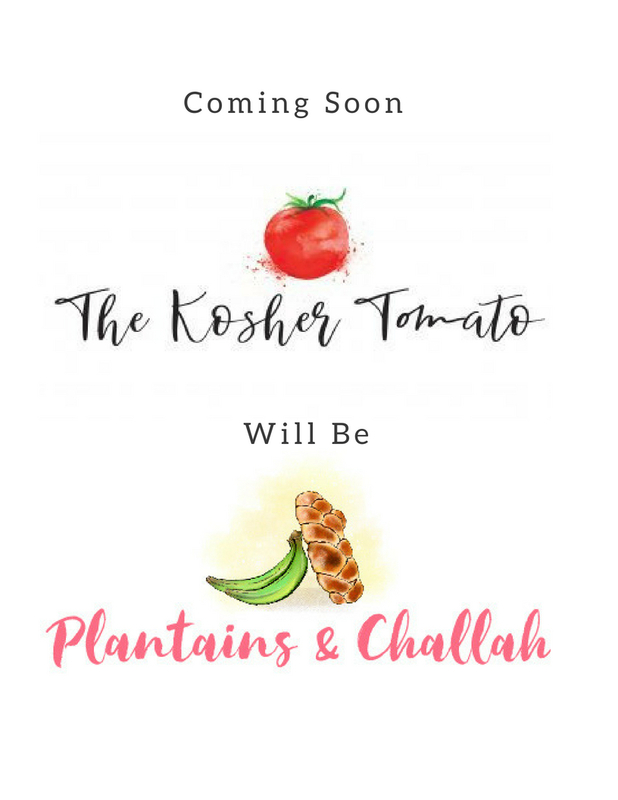 I encouraged others to tell me which two foods represented them; It was actually quite fun, and I think it was then that I realized I really liked “Plantains & Challah” as a blog name. It feels like a perfect fit and I cannot wait for what’s to come! My new website address will be plantainsandchallah.com. I am hoping to just seamlessly forward all my traffic, and get that taken care of over the weekend, but the truth is I am not sure about the technical details on this, and I just ask for your patience during the transition period. If you see anything that isn’t working (links, etc) please let me know! My goal is to empower home cooks with knowledge and give them more confidence in the kitchen. To inspire. I love the feeling of teaching someone something they didn’t know before. I love helping people do something better or faster in the kitchen. First things first, once I am completely changed over, I will be announcing a great giveaway with as a way to celebrate! I also hope to post more consistent content for you. Recipes, articles and videos. As always, I take requests – so don’t be shy. I will be attending the Tastemaker Conference in September, so I will learn even more tools to help serve you better! Hi! I'm Sandy. After graduating The Culinary Institute of America, I cooked my way through various NYC restaurants for 10+ years. Now I want to share everything I've learned with you and teach you the skills you need for confidence in the kitchen!